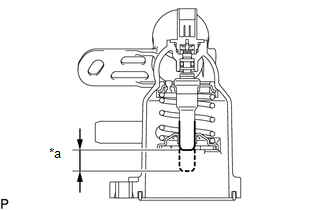 The valve opening temperature is inscribed on the water inlet with thermostat sub-assembly. (a) Immerse the thermostat in the water, then heat the water gradually. Do not your hands into the water that has been heated for the inspection. Touching the heated water could result in burns. 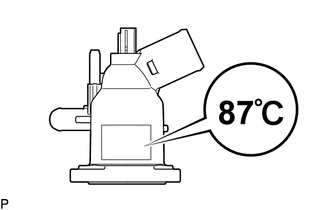 (b) Check the valve opening temperature of the water inlet with thermostat sub-assembly. When checking the water inlet with thermostat sub-assembly in water, keep the terminals dry. After the check, wipe the water inlet with thermostat sub-assembly dry. If the valve opening temperature is not as specified, replace the water inlet with thermostat sub-assembly. If the valve lift is not as specified, replace the water inlet with thermostat sub-assembly. (d) Check that the valve is fully closed when the water inlet with thermostat sub-assembly is at a low temperature (below 40°C (104°F)). If the valve is not fully closed, replace the water inlet with thermostat sub-assembly. If the result is not as specified, replace the water inlet with thermostat sub-assembly.